It's small but powerful!~ That's right... an adjustable strap that attaches your child’s baby bottle, sippy cup, or toy to a stroller, high chair, car seat, and or shopping cart. Sounds simple but this is the first time we've heard of this! 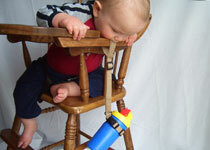 The Lil BahBee strap prevents your child from constantly throwing their sippy cup or bottle to the ground. No more lost or dirty bottles...yippee! Everyone will surely experience the benefits of this must have product. Lil BahBee has designed, tested and patented this product over the last two years and have finally approved of the release of the strap to the public. Check out www.lilbahbee.com - your little lifesaver!